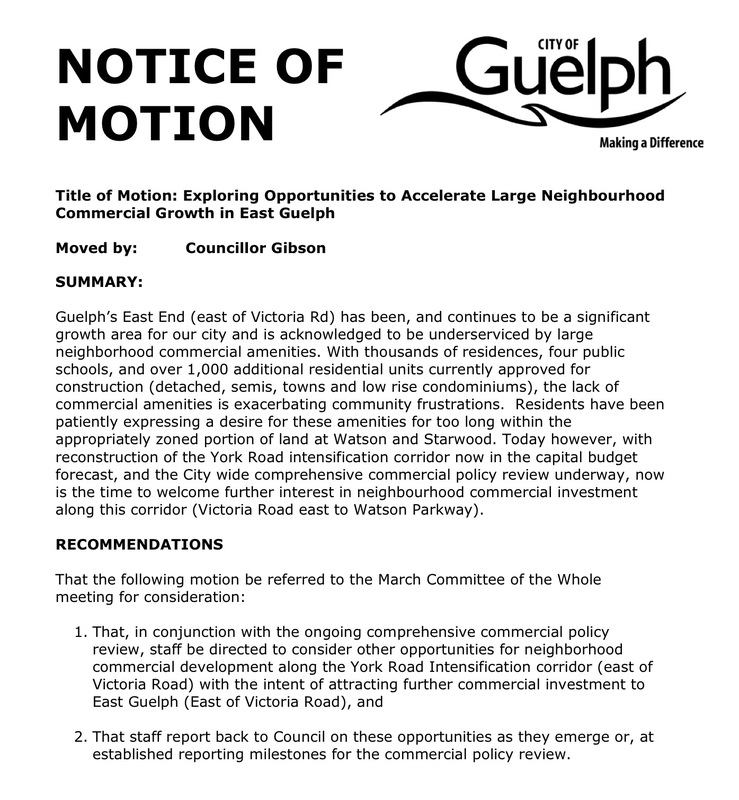 In furthering my committment to advocating for East Guelph commercial development, below please find a motion I will be bringing forward for council’s consideration on Feb 27th. While I continue to champion new commercial development within the long awaited mixed use node at Watson & Starwood, I’ve always maintained that the East End needs more; and moving forward with the reconstruction of York Road presents that opportunity. After successfully getting the York Road Environment Assessment back into the 2015 budget and securing funding for a City wide comprehensive commercial policy review in the 2016 & 2017 budgets, now is the time to be welcoming expressions of interest for commercial development along York Road. This motion sets out to acheive this and directs staff to consider other opportunities, and report back to council as these interests come in to City Hall so that we can respond as quickly as possible. 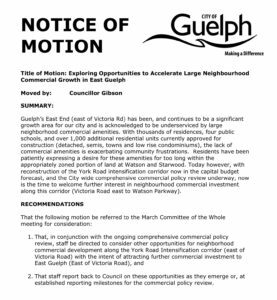 If you agree with this direction (to see commercial redevelopment occur along York Road), I encourage you to express your support by sending an email to clerks@guelph.ca.